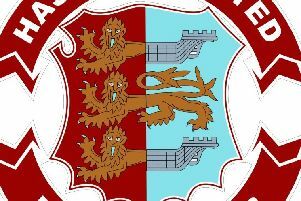 Hastings United Football Club has dropped a place to third in the table after being without a fixture today (Saturday). Chris Agutter’s side was overtaken by Horsham, who moved up to second in the Bostik League South East Division courtesy of a crushing 6-1 win away to Sittingbourne. Fifth-placed Haywards Heath Town won 2-1 at home to Whitstable Town, with former Hastings forward Kenny Pogue scoring the winner, to sit three points behind Hastings. Hastings, who have won their last four matches, have four games remaining in the regular season, starting with a home fixture against Hythe next Saturday (April 13). Long-time leaders Cray Wanderers, incidentally, can wrap up the title if they win at home to bottom side Greenwich Borough tomorrow.